During the summer of 1991, Old Bridge Music released The Carolan Album on cassette only. This recording contained twelve of the best-known compositions of the celebrated blind Irish harper and composer Turlough O'Carolan (1670 - 1738). In 1994 we released The Carolan Album Volume 2 which contained twelve more, perhaps lesser-known, pieces. These two recordings are now available as one album - hence the plural in the title! 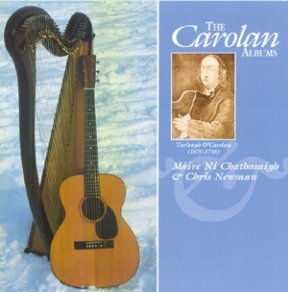 The Carolan Albums is a 66-minute CD containing all 24 tracks from the two cassette releases - the definitive recordings of these much-loved melodies, arranged with meticulous attention to detail for Irish harp and acoustic guitar by Máire Ní Chathasaigh and Chris Newman. The Irish Times "If Máire Ní Chathasaigh wasn't around, Irish harping would be so much the poorer...Her work, which goes beyond mere harp performance, could be described as an attempt to restore the harp to its true voice, or at least a voice that is true to its old self. To do this she has had to immerse herself in those fragmentary remains which endure in manuscript and old collections and which offer the only substantive clues to the way of the old harp...In this enterprise she is joined by Chris Newman, whose sensitivity to the Irish music tradition is well-attested...Harp and guitar partner each other in arrangements which leave conventional accompaniment far behind in their precision and attention to the finest detail. Unfussy, with all the spaces left empty and resonating, the long arm of the music reaches back into a noble tradition." The Daily Telegraph "Her harp-playing is persuasively robust and subtle, while her partner is one of Britain's most impressive acoustic guitarists...For The Carolan Albums, Ní Chathasaigh has added informative notes as a welcome companion to what stands as a masterpiece of virtuosity...This album is a must for any folk-related collection." Taplas "This magnificent collection from two superlative musicians is a welcome addition to the growing catalogue of records of this famous minstrel. In fact, in a plethora of Carolan records, this is the best. Quite apart from the playing, which is, as you would expect from Ní Chathasaigh and Newman, flawless, deft, delicate, uplifting, there is on offer a wider range of Carolan's music than ever before (24 tracks here) and a thoroughly readable booklet on the composer and his music. If what you want to do is to hear just what it was that made this gifted blind musician an ornament to the tradition of harpers, then you will get an inkling here. Highly recommended." Folkwrite "This CD is the product of the now famous collaboration between harpist Máire Ní Chathasaigh and guitarist Chris Newman...The sheer excellence of the musicianship...sets standards which should be aspired to not only in this field but throughout folk music. The sleeve notes are of a comparable standard. This CD is a delight to listen to and is very strongly recommended." Taplas "...All super tunes, and performed with a flawless grace by Máire and Chris. There is sublime guitar on Eleanor Plunkett, and the evocative Bridget Cruise, a beautiful composition for his first love, again in a traditional Irish song style. The playing of this duo exhibits a virtuosity and balance of expression combined with a simple elegance which has a reviewer running to the thesaurus in search of superlatives. Enchanting, expressive, a remarkable piece of work." Newport & Cwmbran Herald & Post "...an absolute gem of a recording...perfection...an outstanding album."